Advent, Advent! On December 8 in 1948, Ernst Reuter became the first Mayor of West-Berlin, the man, who steered the city through the grip of the blockade, the airlift, and the beginnings of the Cold War. He became the face of Berlin and appeared on the cover of Time Magazine. This is somewhat ironic since Reuter had started his political career as a Communist, joining the Bolsheviks after he was captured by the Russian army in WWI. When he returned to Berlin, he fought for the revolution of 1919. But after a fallout with Lenin, he was expelled from the party. He joined the Social Democrats and, in 1926, became commissioner in the City government. When the Nazis came to power, they rounded up all Communist and Social Democratic politicians. Reuter ended up in the concentration camp of Lichtenburg. After his release, he fled to Turkey, where he spent the war, teaching at the University of Ankara. After World War II, he returned to Berlin, joined the city government again, and was elected Lord Mayor in 1947. The Soviets, however, did not accept him. The blockade finally split the city politically. 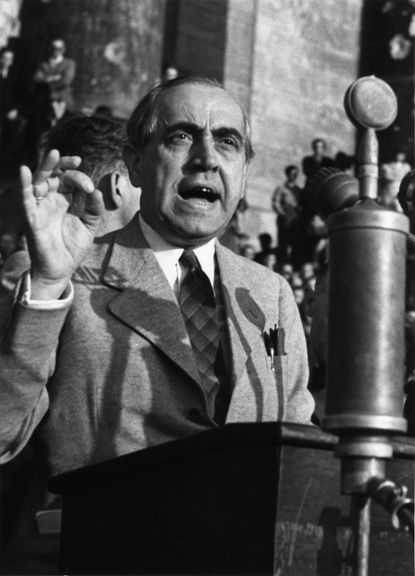 Reuter became famous for his speech in front of the burned-out Reichstag on September 9, 1948, where he appealed to the world not to abandon Berlin, in front of a crowd of 300,000 people. Two months later, he was elected Mayor and remained on this post until his early death in 1953. His funeral was attended by more than a million people. 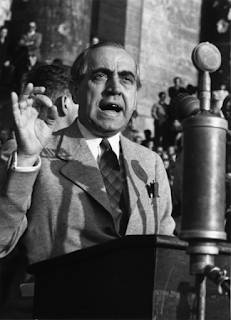 This picture of Ernst Reuter is from our book Berlin in the Cold War. 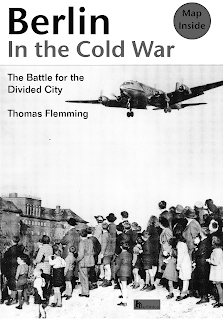 The Battle for the Divided City, by Thomas Flemming.